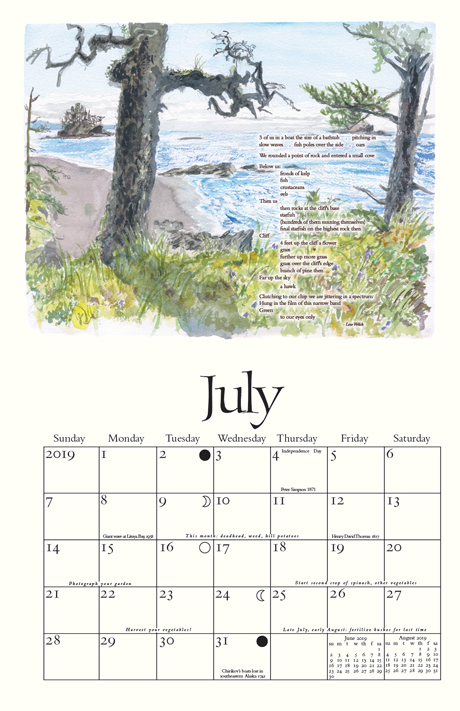 The Images included on this page are a part of my 2019 calendar, and some are also available as separate notecards and prints. Size of calendar, open is 11" by 17"
For back issues of calendars, see below. Postage in the United States is for US Priority Mail. To Canada postage is International Priority Mail. Prices for original wood engraving prints are with each image. Most are $35. Satisfaction guaranteed: If you send back items (in good condition) within 30 days, I'll give you a full refund. Gift Orders: I can mail an order directly, with gift card, to recipient of your choice. Write that it is a gift, and the text you want on the gift card, in the "special instructions" box in the order form. If they don't give you a box for that - just call or email me with the info. Write or call for orders outside the US and Canada. Wholesale and quantity prices available: write or call. 2003 Exploring southeastern Alaska. Text by Walt Whitman and Alaska writers. 2004 Reflection - old boats, buildings, nature. No text. 2005 Flowers, boats and landscapes. No text. 2006 Experience: we gain something with age. Poetry by Alaskans Nora Marks Dauenhauer, Robert Davis and Sheila Nickerson, and Eliot and Wordsworth. 2007 Joy of Living. Poetry by Alaskans Ann Chandonnet and Rhonda Bowen, and the Bible, Wordsworth, Spenser, Whitman, and Blake. 2008 has half of the pages with full color; from 2009 on they are full color. 2012: Desire to dissolve into nature. 2013: Ecstatic connection to nature. 2015: Being present in the moment. 2017: Enjoying the passage of time. You can now purchase Outer Coast items using your credit card. This goes to a secure PayPal site, so your information is protected. I receive your order instantly and mail it on out.